Since New Year's Day, when Ryan Suter was officially announced as a member of Team USA, he has been on a collision course with Shea Weber and Team Canada for the Gold Medal game in Men's hockey. In the days leading up to the Olympic break, there was plenty of kidding and questions surrounding the US-Canada match last Sunday, but few experts actually believed that a US-Canada final would actually come to pass. Suter and Weber are great friends off the ice and as teammates with the Nashville Predators, but all that will be set aside for several hours when the puck is dropped. The Olympics have provided the Predators with more positive most national (and international) exposure than they have seen in the franchise's twelve year history, much of it due to Weber and Suter's exploits during the games. Both have been cornerstones of their team's defense during the Olympic tournament, and have provided a surprising amount of offense as they are each ranked in the top seven defensemen in scoring. Shea Weber has scored two goals and added four assists for Canada in six games. He is also has a plus six in the plus/minus rating. Ryan Suter has four assists and has been plus eight in five games while leading all US defensemen in minutes per game. Ryan Suter, who hails from Madison, Wisconsin, is best known for his Olympic pedigree coming into the Vancouver games. His father, Bob Suter, was a member of the 1980 USA team that won the "Miracle on Ice" game against the Soviets on their march to the gold medal. Ryan is only 25 years old so everything he knows about the 1980 games has been second hand from others. Ryan is much more familiar with his uncle, Gary Suter's Olympic exploits when he won the silver medal with Team USA at the Salt Lake City games in 2002. Shea Weber, who grew up in Sicamous, British Columbia, does not have a family history in the Olympics but has become an Olympic legend this year with a slap shot that was so hard that it went through the netting in the goal in a game against Germany last Tuesday. After Weber's shot, play continued as no one believed that it went in as it flew straight to the back wall. Only after a stoppage, a video review, and an inspection of the net was it discovered that it was indeed a goal. Both Weber and Suter were drafted by the Predators at the 2003 NHL Entry draft that was held in Nashville. Suter was the first American taken in the draft as the seventh pick. Weber was drafted in the second round, 49th overall. Ryan Suter's career got its start playing two years in the US National Development Program from 2001 to 2003 where he played in several international competitions and was the first USNDP player to win Gold in both the U-17 and U-18 world tournaments in 2002. Suter spent a year at University of Wisconsin in 2003-2004 and helped the US win their first gold medal at the World Juniors in 2004. He has played in four World Championship Tournaments and a total of 58 games for the US in international competition. In 2004-2005, Suter played for Milwaukee in the AHL and has been with the Predators since 2005. In 372 games with the Predators, he has 25 goals and 117 assists. Shea Weber played in the Canadian Junior program witht he Kelowna Rockets from 2001-2005. In 2005-2006, he split time between Milwaukee and Nashville. In the World Juniors in 2006, he played on one of Canada's best junior teams with current Olympic teammates Sidney Crosby, Brent Seabrook, Patrice Bergeron, Ryan Getzlaf, Corey Perry and Mike Richards. Weber made the permanent jump to the Predators in 2006 and has played 301 games in Nashville scoring 59 goals and adding 99 assists. Playing in the World Championship last spring for Canada, Weber burst on to the international scene as a star when he had four goals and 8 assists in nine games as Canada took the silver medal. Both Suter and Weber are having an excellent season with the Preds this year where they are paired together on what is considered one of the best defensive twosomes in the NHL. The most common question asked leading up to the games was what would Ryan do if he was in front of one of Shea's massive slap shots, which are some of the hardest in the league and have caused numerous injuries for Pred players and opponents alike. Suter has always smiled and responded that he would get out of the way. Don't believe it for a minute. With national pride at stake on Sunday afternoon, Suter will risk life and limb and do what ever he can to stop Weber's shot. Sunday's game will be televised by NBC beginning at 2 p.m. CST. Team USA's 6-1 shocker over a strong Finnish team is one of the biggest surprises at the Olympics this year and is in the same category as Canada beating Russia handily Wednesday night. Ryan Suter played another stong game for the USA logging almost twenty minutes and finishing with a +2 rating. Canada had a more competitive contest with Slovakia winning 3-2 in a game that went down to the wire. She Weber played almost twenty minutes and piced up an early assist when Patrick Marleau tipped one of his bombs into the net. Slovakia will now face Finland tonight at 9 p.m. CST on CNBC for the Bronze metal. The big match that all have been waiting for is Sunday at 2 p.m. on NBC when Canada seeks revenge against the USA in the gold medal game. We will be at Bleachers in Franklin for the big Section 303 Tweetup Viewing Party. We hope to see you there. This just in... A new 303:30 from the hosts of the party just got posted. John Glennon takes a look at the march to the playoffs and what the Preds will face. Bryan Mullen has an update from the Pred's practice on Friday. Five year old Josh Sacco from Spring Hill was one of the media stars of the Olympics and he did a daily series for Predators.com, met with the US Men's Hockey team, and was the object of many stories throughout North America. On Thursday, he was on the CBS Evening news. Here's a piece off their web site. He also appeared on ESPN's SportsCenter with his dad, Jim. Mark's weekly View is up at 111. This is the one we've been waiting for - The Hockey Tonk in Smashville. It's sad that Mark looks comfortable in his outfit. Shea Weber is listed as one of the "surprises"at the games by NHL All Access. It's no surprise to those who watch him every night. Here's a neat story from Milwaukee on Jon Blum, Chet Picard and Colin Wilson learning the ropes together. Adrian Dater has a preview of Sunday's USA-Canada game. Ain't No Party like a Gold Medal Party, hat's off to the Canadian women! NBC fell for a prank interview where a fake Ryan Miller guaranteed a win on Sunday. Ryan at the RLD has the Eastern Conference Trade deadline round-up also the Western where he predicts that the Preds will be active. He also has the top five candidates for the Hart Trophy. What do a Manhattan Hospital and the Lighthouse project have in common? Read Nick Giglia's story and see. Cam Janssen reponds to his five game suspension via Twitter @CamJanssen55: looks like my break will be a little longer. 5 games longer that is, ill be more alert in these situations, but it wont change my game! We talk about the Corsi number a lot in our game summaries as it is indicative of who is putting pressure on the opponent's defense. Kent Wilson has a fairly straight forward post about what the Corsi reflects in a game. Who would have thought that Washington would be one of the four teams with no players left in the final four. Did you know that only 50% of Twitter messages are in English? Olympic hockey's version of the final four kicks off this afternoon when USA plays Finland at 2 p.m. CST (NBC-don't expect postgame coverage due to Oprah at 4:00) and finishes tonight when Canada will play Slovakia at 8:30 p.m. CST (CNBC). If the US and Canadian teams take care of business today, it will lead to the showdown on Sunday that fans in both countries have been waiting for after last Sunday's USA upset of Canada in the qualifying round. Don't forget about Section 303's viewing party at Bleachers on Sunday where there will be plenty of giveaways and good fellowship. To respond via Twtvite go here. Shea Weber for Canada and Ryan Suter for Team USA are the two Predators left in the competition and both have been impact players for their teams. Weber has two goals and three assists and provided the best memory of the tournament so far when he blew a puck threw the net on Tuesday night. Ryan Suter has four assists and has led Team USA in minutes played and seemed to be on the ice for the last half of the third period against Switzerland. It should be a fun final three games to the tournament and hopefully will get Pred fans in the mood to pack the Bridgestone Arena on Tuesday night when the Preds return against Edmonton. John Glennon has the schedule for the Olympic returnees and news that Cody Franson may not be ready by Tuesday. He also has the lowdown on the Dan Hamhuis trade rumors and Barry Trotz's view of the Olympics. Jas Faulkner asks the question that many have wondered. Why are Weber and Suter more dominant on the world stage than they are playing for the Preds? Jim Diamond discusses no touch icing. Sully thinks it's a good idea after getting nailed at MSG before the break. David Boclair discusses injuries and returns. Congrats to Dirk for one year of On The Forecheck. He celebrates with the same poll that he ran on day one. AJ tackles a variety of topics at PMFF and gives a nod to POTG and OTF as being "meat and potatoes". I won't speak for Dirk, but I do appear to have had my share. Rachel says it's getting down to the wire. Eric Kent has the sad news of the Ad's 4-1 loss to Rockford last night. Ryan Suter is doing a little pickin' and grinnin' with his new Gibson Dust Tiger. Prospect Ryan Ellis was named the Golden Horseshoe Athlete of the Year. Max Preps compares the 1980 Men's team and and this year's mens team that are connected by the name Suter. Team Canada's women's team smothered Team USA in a 2-0 win last night. The two teams are so much better than the rest of the world, there is serious discussion about booting the event out of the Olympics. The post victory celebration got too rowdy for the IOC and they will investigate the "behavior" of Canadian women hockey players who celebrated gold by swigging beer champagne on ice. LeBrun and Burnside discuss how Slovakia could upset Canada and Finland could beat Team USA. Puck Daddy has more on the Mike Milbury's "Eurotrash" comment including the clip. The NHLPA is running a contest to give away a free jersey. Go here to enter. I'm not sure why they are doing this but I would take a free jersey. PS: US and Quebec residents are prohibited from entering. Michelle Kenneth writes about the Slovakia win and the upcoming final four. A look at the World Rankings shows that Finland is rated higher than Team USA. There appears to be a difference in how NHL commissioner Gary Bettman views the relationship with the KHL and how KHL commissioner Alexander Medvedev sees it. SI has a good story about Brian Burke attending to his Olympic duties in spite of his son Brendon's death. I'm not sure I could have done it. Matt Reitz continues his look at all 30 teams at the trade deadline and gives his take on the Central Division this morning. This has really been a good series. Puck The Media has the release for the added games on Versus next week. Sorry DirecTV customers. Steve also has info on the 70th anniversary of the first hockey game on TV. Also from Steve comes this @stevelepore: NHL Network will air TSN Tradecenter from 10am-6pm this year. Congrats to Brandon Worley who is leaving SB's Defending Big D for a new gig doing a hockey Blog for NBC. Tom Petty announced a new album and a Summer tour that will stop at the Sommet Center on August 12. There is also a stream of a song off the new album for you to sample. If you are one of the few that haven't heard @ConanOBrien is a verified Twitter account that is adding about 10,000 followers an hour. The Nashville Predators ended their recent ‘goalie controversy” by resigning Pekka Rinne to a two-year, $6.8 million contract that will pay the big netminder $2.8 million in 2010-2011 and $4.0 million in 2011-2012. Over the last couple of months, neither Rinne or Dan Ellis has been dominant enough to lay claim to the number one goalie slot as both have struggled in net at times. Coach Barry Trotz even tried an every other game rotation for an extended period. Predator’s General Manager David Poile made his choice clear by signing Rinne before decisions are made prior to next Wednesday’s NHL trade deadline. Both Rinne and Ellis were slated to become unrestricted free agents on July1. Rinne is making $725,000 this season while Ellis is receiving $2 million. There is little chance that the Predators will re-sign Ellis with the additional salary now committed to Rinne. It is unclear if the Predators will attempt to deal Dan Ellis at the trade deadline in exchange for another goal scorer for the offensively challenged team. If Ellis were dealt, the Preds would have to pick up another goalie since no one in their system is ready to make the jump to the NHL. This season, Rinne is 20-12-4 with three shutouts after last year’s rookie year when he was 29-15-4 with seven shutouts. Pekka has had an eye on the Olympics, “It’s nice to see my teammates playing well and playing in big rolls like Sutter and Weber and same thing with Hornqvist, Marty, Goc and Sulzer. The Predators return to the ice next Tuesday in a game against Edmonton in the newly named, Bridgestone Arena. They are currently in seventh place in the tightly bunched Western Conference. Pekka Rinne may look funny in cowboy garb, but the Predator’s opponents will not be laughing when facing Pekka in in the net, wearing his normal goalie attire. Congratulations to Pekka, his agent Jay Grossman, and the Predator organization for getting a deal done that will keep the big man in goal for the Preds for the next two seasons. If you would like to hear Pekka speaking, go here to listen to the interview in its entirety. John Glennon has his Pekka Rinne story and a nice piece about Ryan Suter's extended duty on Wednesday. He also has a report that Jered Smithson and Cody Franson have returned to practice and David Poile's comments on the Rinne signing. Jim Diamond has a story on the Pekka signing as does David Boclair at the City Paper. Forechecker takes a look at Pekka's new contract numbers beside other recent goalie signings and has a poll as to the value of the contract for the Preds. John Glennon discusses the Pred's priority at the trade deadline at Inside Predators. Eric Kent at Admiral's Short Shifts has an exclusive interview with Wild coach Todd Richards who visited Milwaukee a few days ago. No pictures yet from the Pred's Gala last night but I'm sure embarrassing photos will be forthcoming today. The stage is set for Friday's Men's Simi-finals. USA will play Finland at 2 p.m. CST and Canada will play Slovakia at 8:30 p.m. CST. This was set up by Team USA beating a gutty Switzerland team 2-0, Canada blasting Russia 7-3, Finland besting the Czechs 2-0 in a tight game, and Slovakia eliminating the defending champion, Sweden 4-3. Both Ryan Suter and Shea Weber had big games for their teams with each being a dominant force on defense and Weber scoring a goal for a second straight game. Patric Hornqvist has his first goal in Sweden's loss. The biggest disappointment had to be a delay of game penalty against Marty Erat that led to the goal that gave Finland the victory of his Czech team. You had to feel horrible for Marty. Somewhat overlooked in all the men's hockey excitement is tonight's Women's hockey Gold Medal game between the USA and Canada. This will be the first competitive game that either team has played in the tournament and it should be a good match. Puck drop is set for 5:30 CST with the pre-game starting at 5:00 on MSNBC. Bruce Hollingdrake has a great video diary of the Crosby-Ovechkin rivalry. Another chapter was written last night with the thrashing Canada gave Ovi and the Russians. One of the highlight's of last night's Olympic viewing was Mike Milbury's referring to the Russians as "Eurotrash." After intense chatter by a throng on Twitter, Steve Lepore put a post on the topic up at Puck The Media. Rachel at What The Puck muses over the Olympics and has the ballot to cast your vote in the Commercial Smackdown. Is $2 Billion in players worth more than a pair of tickets per team? Ted Leonsis thinks not. Ryan at the RLD looks at the Top Five Vezina Trophy candidates. Here's an interesting quiz from Pew Research to find out how Millennial you are. I ended up halfway between a baby boomer (which I fall in the middle of by date of birth) and a Gen-Xer. I re-took it throwing out watching TV and reading a newspaper in the last 24 hours which I generally don't do and it moved me to halfway between a Gen-Xer and a Millennial. Who knew? I had no idea that the Southern dude who was Ole Miss' mascot was canned in 2003 and the Rebels have been without a mascot since. It looks like the door has opened for a new one. The old one was one of the more distinctive ones in college sports. I guess the next step will be to quit calling them the Rebels. From the folks at People of Walmart comes You Drive What? How did I miss this before now? For those so inclined, you can follow the Dalai Lama on Twitter on his verified account. Finally, Yahoo and Twitter tie the knot and more Twitter integration is expected into Yahoo in the near future. Thanks to Agent Jay Grossman for setting up an interview with Pred's Goalie Pekka Rinne this afternoon after he signed his new two-year $6.8 million contract. Pekka was obviously excited and relieved, and ready to get back to work on the ice. It is an interesting, wide-ranging interview that even includes a story about Pekka playing a little pond hockey last week in Finland while on vacation and a preview of his outfit for the Predator's Gala tonight. The Nashville Predators officially announced the details of Pekka Rinne's new two-year deal that will pay him a total of $6.8 million over the next two years. The expected cap hit will be for $3.4 million per year and will pay Rinne $2.8 million in 2010-2011 and $4.0 million in 2011-2012. The amount of the contract will make it difficult for the Predators to re-sign goalie Dan Ellis who is making $2 million this season and is slated to become an unrestricted free agent on July1. It is unclear if he will be dealt prior to next week's trade deadline or if he will remain with the Preds for the rest of the season. If Ellis were to be traded, the Predators would be faced with picking up another goaltender as neither Mark Dekanich or Chet Pickard appears ready to assume a backup role in the NHL at this time. With team chemistry being an important part of Barry Trotz's teams, it may be that Ellis will be retained through the end of the season as opposed to bringing someone new in to the room for the stretch run. Nashville, Tenn. (February 24, 2010) – Nashville Predators President of Hockey Operations/General Manager David Poile announced today that the club has signed goaltender Pekka Rinne to a two-year, $6.8 million contract. The deal will pay him $2.8 million in 2010-11 and $4 million in 2011-12. Rinne, 27 (11/3/82), has posted a 20-12-4 record in his second full NHL season, which included a franchise record seven-game winning streak from Nov. 12-25, 2009. As a rookie in 2008-09, the Kempele, Finland native ranked among the League leaders in shutouts (tied for fourth with a franchise-record 7), goals-against average (sixth, 2.38) and save percentage (tied for ninth, .917), in addition to finishing fourth in voting for the Calder Trophy. His 29 wins a season ago were also tied for the ninth-most by a first-year netminder in NHL history. Nashville’s 10th choice, 258th overall (eighth round), of the 2004 Entry Draft has appeared in 95 career contests since making his NHL debut on Dec. 15, 2005, accumulating a 50-28-8 record, 2.56 goals-against average, a .917 save percentage and 10 shutouts. He represented his native Finland for the first time in last May’s 2009 World Championships in Switzerland, starting six of the nation’s seven games. He was voted one of Finland’s three best players of the tournament after ranking third in goals-against average (1.93) and sixth in save percentage (.926). Update: John Glennon at The Tennessean reports the contract is a two-year deal worth $6.8 million that will pay $2.8 million in 2010-2011 and $4 million in 2011-2012. Martin Erat is the only Nashville Predator playing in the 2010 Olympics with a medal already in his possession. At the 2006 Olympics in Torino, Erat scored the game-winning goal for the Czech Republic in the third place game to pick up a bronze medal. As Erat heads to Vancouver, he has the second longest tenure with the Nashville Predators. Only David Legwand, who was the original draft pick in the 1998 NHL Entry Draft, has been in the organization longer. The 28 year old native of Trebic, Czech Republic was a seventh round (191st overall) in the 1999 draft. After he was drafted, he played two years of junior hockey in the Western Hockey League in order to transition to the North American game. Playing with Red Deer, in 2001, he won the Memorial Cup (championship of the Canadian Hockey League) and led his team and goals and points in the playoffs. He also won a Gold Medal representing the Czech Republic in the World Junior tournament mid-season in 2001. With the Predators in desperate need of scoring, Erat made the rare jump from junior hockey to the NHL for the 2001-2002 season. In his first year with the Preds, he set rookie records for games (80) and assists (23) and he also scored nine goals. For the better part of three seasons from 2001-2004 Erat played on one of the more memorable lines in Predator history, the "vowel" line. He generally played along side Vladimir Orszagh and Denis Arkhipov, who were also young players from Eastern Europe. Erat was considered the least talented of the three line mates and actually was sent to the AHL for a portion of the 2002-2003 season. Now, Orszagh is retired and Arkhipov is toiling in the KHL, while Erat has become the highest paid Predator in team history signing a contract last year that will keep him with the Preds through the 2013-2014 season. In eight seasons with the Predators, Erat is among franchise leaders in several categories. He is second in goals scored (121) and total points (339), and is third in assists (218) and games played (532). Erat is currently having one of his better seasons scoring 19 goals and adding 20 assists in 54 games. After a slow start, Erat has scored 14 goals since the first of December and has been the best player on the ice at times this year for the Preds. His best years came in 2006-2007 and 2007-2008 when he logged 57 points in consecutive seasons. Erat's best year in the playoffs was 2007-2008 when he had a goal and three assists as the Predators lost to Detroit in six games. At the Olympics in Vancouver, Erat has been reunited with former teammate Tomas Vokoun who will be the starter in goal for the Czechs. The Czech Republic is considered to be a top five team and while not the favorite stands a good chance of a medal. Erat's Czech Republic team beat Latvia 3-2 in overtime last night and will face Finland tonight at 9 p.m. CST in the quarterfinals of the medal round. 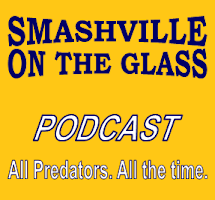 A big thanks to On Nashville and Eric Shuff as we hear that PredsOnTheGlass will be featured on the new site that highlights various blogs around Nashville and has the most comprehensive blog roll in the area covering blogs of all types and tastes. It is quite an honor since the site started this week and we are one of the first featured web sites. Thanks again! Forechecker has a post on the new Arena deal that includes an MP3 of an interview with Ed Lang at the bottom of the post. Dirk also has come out with a new OnTheForecheck line of clothing. John Glennon has news on the Alexander Radulov front at Inside Predators. We will never see him in a Pred's uniform again. See Puck City has a story about the big Predator comedy night at Zanies last night. It sounds like it was a blast. It looks like the place was packed. Jas Faulkner continues his Olympic Odd Couple story with part three of the series. Jim Diamond chronicles Canada's win and the end of the line for Goc and Sulzer. Another view was that Canada's 8-2 win over Germany was deemed a "national tragedy" in Canada. One of the highlights of the game was Shea Weber blowing a puck through the net. Here is the video. John Glennon previews today's Canada Russia matchup which should be one for the ages in Olympic hockey history. While the world will be watching Canada and Russia, Team USA's focus will be on Switzerland at 2 p.m. CST. From the Rink looks at the time split between action and commercials at the Olympics. This is another explanation why hockey gets sent off to cable. Mirtle takes a look at team depth among future Team Canada opponents. Puck Daddy looks at the five biggest disappointments of the season so far. It's been a while but Mick and Eric are back with the One Percentile Podcast Episode 24 discussing the USA-Canada game. Mile High Hockey has a two part interview with Adrian Dater. Here is part one and two. It is a good read. RLD Hockey Radio podcast volume 2 is up for your listening pleasure. Paul Kelly and the NHLPA have settled their differences. At a press conference this morning, the official announcement was made that he Sommet Center will be renamed the Bridgestone Arena. The agreement is for five years. I have not heard any dollar amounts revealed at this time. Nashville Predators and Bridgestone Americas announce naming rights partnership. Venue to be renamed Bridgestone Arena. (Nashville, TN – February 23, 2010) The Nashville Predators and Bridgestone Americas, Inc. are proud to announce a naming rights partnership for the home of the Nashville Predators. Pending Sports Authority approval, the new venue name will be Bridgestone Arena starting with the March 2nd Predators game. The initial term of the agreement is 5 years with extension options. In addition to the naming rights agreement, the Predators and BATO announced a five year extension of their existing marketing partnership. “Bridgestone is a first-class business and a model corporate citizen. I am proud to have their name associated with Nashville, with our great hockey team and with our arena. This is a good fit for the Predators. Bridgestone is actively engaged in the Nashville community and active in promoting sports. I look forward to watching a Predators game at the Bridgestone Arena,” Nashville Mayor Karl Dean said. Bridgestone Arena opened in December 1996. The facility has hosted over 11 million guests for such events as the NCAA Men’s Basketball Regional Tournament, SEC and OVC Men’s & Women’s Basketball Tournament, as well as entertainers such as Garth Brooks, Elton John and Billy Joel, Rolling Stones, Tim McGraw, Faith Hill and Martina McBride. The Bridgestone Arena has been the home of the NHL’s Nashville Predators since 1998. Since they were announced as the National Hockey League's 27th franchise in 1998, the Nashville Predators have grown from a young expansion franchise to a regular contender in the Stanley Cup playoffs. Over the past 12 seasons, the Predators have proven themselves to be a hard-working, blue collar team on the ice – racking up four consecutive playoff berths (2003-2008) along the way. Off the ice, the Predators are proud to support the Nashville community which supports them, with the Nashville Predators Foundation raising more than $2.0 million in grants and donations for area charity organizations. Nashville, Tenn.-based Bridgestone Americas, Inc. (BSAM) is the U.S. subsidiary of Bridgestone Corporation, the world’s largest tire and rubber company. BSAM and its subsidiaries develop, manufacture and market a wide range of Bridgestone, Firestone and associate brand tires to address the needs of a broad range of customers, including consumers, automotive and commercial vehicle original equipment manufacturers, and those in the agricultural, forestry and mining industries. The companies are also engaged in retreading operations throughout the Western Hemisphere and produce air springs, roofing materials, and industrial fibers and textiles. The BSAM family of companies also operates the world’s largest chain of automotive tire and service centers. Guided by its One Team, One Planet message, the company is dedicated to achieving a positive environmental impact in all of the communities it calls home. Last night's POTG Radio episode is now available on podcast for your listening pleasure. We had a good conversation with Steve Lapore of Puck the Media on a wide variety of topics including NBC's Olympic coverage, the uniqueness of his site, and the way hockey is covered in the media in general. If you aren't familiar with his site you should check it out. He is the only person on the internet that focuses exclusively on how the media treats hockey and it should be on your daily read list. We also had Josh Burnett and Joe Bechtel from the new hockey humor site, Intent to Blow. It was launched on February 1 by our two guests along with Steve Stirling. The site has really taken off in a short period of time. Their stories are well written and believable (up to a point). Written humor is hard to pull off but these guys have found out how to get it done. This is another site that has become a must read on a daily basis. The Preds, who are still in town, hit the ice yesterday for practice. They will have Wednesday off for the big Preds gala but will try to loosen up each day for the rest of the week. It's official that the Sommet Center arena will now be the Bridgestone Arena. An official announcement is expected at a press conference at 10 a.m. this morning. The Tennessean has a letter from Ed Lang to the Sports Council which is about as official as it gets. More big news from Milwaukee that they have extended their agreement with the Predators for two more years with an option for a third. John Glennon says that the Pred players have kept things in perspective in Vancouver. Potential bad news for Pred fans was Patric Hornqvist taking a head shot in the late game on Sunday night. According to Dirk's translation, he came out "clear as a bell." Pikanen is suspended for Wednesday's game due to the hit. Thanks again to Eric Shuff and the Tennessean for creating anew blog roll of over 100 blogs in the Nashville area covering a wide range of topics and including POTG and other Pred blogs in the list. Here is the opening note from Eric. From the City Paper comes a story that the Nashville Sports Council will seek and NHL All-Star game. David Boclair at The City Paper touches on the injury risks involved in Olympic play. Switzerland vs. Belarus (2:00 CST, USA) Winner will play US on Wed.
Wednesday's USA vs Switzerland-Belarus winner will actually be on NBC at 2:00 in the afternoon. Ice dancing is taking a day off. Trouble in Olympic paradise as Canada will start Roberto Luongo vs Germany tonight. Steve Lapore, our guest last night on POTG, talks about the huge mistake made by NBC. The New York Times has an explanation of why hockey doesn't make it to prime time on NBC. According to Sports Business Journal, the rights fees may not continue to climb for the 2014 and 2017 Olympic games. They also report that the ratings are up 21 % from Turin but down from 2002 in Stl Lake City. According to this release 87 million folks watched the Olympics on Sunday in the US. NBC did a mashup of their coverage vs the CBC's on the US-Canada game. Stats have been hard to come by from most traditional sources. Here is everything in a nutshell at the IIHF Site. Matt Reitz takes a look at each team at the trade deadline in a six parter by division and starts with the Atlantic division and will take a division a day all week long. Will Jaromir Jagr return to the NHL? Russ Cohen releases the near miss list from his 100 Ranger Greats book. Interesting. The RedLightDistrict does not play the homer card in listing their top five picks for the Norris Trophy. NHL Home Ice's Facebook page has pictures of Mike Ross and Shawn Lavigne at the AHL outdoor game over the weekend. For those with a Blackberry Tour with trackball issues, here is another suggestion. I didn't quite get it to work as well as the guy in the video but will try it again later. In a flurry of activity about 4:30 CST this afternoon, the Tennessean posted a letter from Ed Lang to the Sports Council asking for a vote for a name change to Bridgestone Arena from the Sommet Center. A press conference is slated for Tuesday morning at the Sommet Center. At the same time, the Milwaukee Admirals announced that their agreement with the Preds has been extended. Nashville, Tenn. (February 22, 2010) – Nashville Predators President of Hockey Operations/General Manager David Poile announced today that the club has extended its affiliation agreement with the Milwaukee Admirals of the American Hockey League through the 2011-12 season. The agreement also has a mutual option for the 2012-13 season. “We as an organization have always told our players that the road to Nashville runs through Milwaukee and a look at our roster illustrates this,” said Poile. “The Milwaukee Admirals have cultivated a winning tradition, earning two trips to the AHL Calder Cup Finals in the last six years, including a championship in 2004, and last season they finished the regular season tied for the most points in the American Hockey League. With a bright and trusted coach in Lane Lambert, the Milwaukee ownership group led by Harris Turer and Jon Greenberg’s front-office staff, this is the kind of environment we love having our players in. In the 11 years that the two clubs have functioned as affiliates, it has become customary for Nashville Predators to pass through Milwaukee en route to the National Hockey League. One hundred and four players have played at least one game for both teams, and Predators assistant coach Peter Horachek served as the head coach of the Admirals in 2002-03. This season alone, forwards Triston Grant, Ben Guite, Ryan Jones, Cal O’Reilly, Mike Santorelli, Dave Scatchard, Nick Spaling, Andreas Thuresson, Colin Wilson and Peter Olvecky and defensemen Cody Franson, Teemu Laakso and Alexander Sulzer have appeared in games for both Nashville and Milwaukee. 2009 NHL All-Star Shea Weber started his pro career with Milwaukee in 2005-06, and Patric Hornqvist, Nashville’s leading scorer in 2009-10, appeared in 49 games with the Admirals last season. Other Nashville Predators that spent time developing in Milwaukee include forwards Martin Erat, Jerred Smithson, Jordin Tootoo, defensemen Dan Hamhuis, Kevin Klein and Ryan Suter and goatender Pekka Rinne. The Admirals, who are the only team in the AHL to finish with at least 40 wins and 90 points in each of the last six seasons, are currently in third place in the AHL’s West Division with a record of 32-20-1-5. The Admirals have been Nashville’s primary developmental affiliate since the Predators’ inaugural NHL season in 1998-99. Milwaukee joined the AHL in 2001 after 24 seasons in the International Hockey League. Team USA played an unbelievable game and managed to beat Canada on Sunday night in what may have been the second biggest win in USA's Olympic history. Coming on the heels of the US winning the Junior tournament last month, it was a statement game in that the US has gotten closer to Canada in their development program. Team USA's speed appeared to be the deciding factor between the two squads as the US won 5-3 in the game that went down to the wire. The real test will come this week as the US will have to win three more games if they are to take home the gold medal. Canada ended up as the sixth seed and will go to the other side of the bracket. Team USA will play the lowest seed coming out of Tuesdays games which will be either Switzerland or Belarus. Dirk Hoag has a good explanation of the bracket. This week's show should be one of the best we have had. With no men's hockey tonight, this will be a good week to tune in. This week we will have Steve Lapore of Puck the Media to discuss the a wide variety of topics including NBC's Olympic coverage and the media in general. If you aren't familiar with his site you should check it out. He is the only person on the internet that focuses exclusively on how the media treats hockey. We will also have Josh Burnett and Joe Bechtel from the new hockey humor site, Intent to Blow. The site was started by our two guests along with Steve Stirling and has had great success. Humor is hard to do, but they do it well. Their stories are well written and many folks actually believe what they say. I retweeted their story about Rick DePietro getting sued for his Hockey is for Everyone escapade and several folks bought the premise and were outraged. We are looking forward to talking to all of our guests as it should be an interesting show. Please join us live at 7 p.m. Central or on podcast after the show. Thanks to the Tennessean for a mention for POTG for additional Olympic coverage as well as pointing out a few other local blogs. AJ has a great account of the Olympic viewing party at O'Charly's in Franklin last night. It sounds like a big time was had by all. See Puck City was also there and reflects on the evening. Next Sunday's gold medal party will be sponsored by Section 303 and be at Bleachers in Franklin. Jim Diamond keeps up with the prospects in his weekly piece. Hockey's Future shuffles the deck to come up with the new version of the Pred's top 20 prospects. The Olympics will be over soon and thoughts return to the Preds. Paul McCann is putting together a road trip to St Louis for the game on Sunday March 21. Go to HockeyBuzz Radio's Facebook fan page or event page for details. Mark has his weekly View at The View from 111. From the Vanderbilt Athletic Department comes news that Commodore sports will now be on 97.1 exclusively starting next fall. Will this open the door for the Predators to not be bounced all over the dial? Forechecker has more on the story. Rachel continues the Olympics Commercial Smackdown and hits on my favorite. I like it not so much for the visuals, but for the revival of Lou Reed's 1972 version of Perfect Day. I was a huge Lou Reed fan during that era and lost a considerable amount of hearing capability listening to the 1974 Rock n Roll Animal album (as in vinyl and 8 track) at full volume. There's been one a day since Friday so go here to see them all. Admiral's Short Shifts has the story of the Ads 2-0 win over Houston on Friday. Highlights included a Mark Dekanich shutout and a Colin Wilson fight. The Ads beat Rockford yesterday 4-1 and Colin Wilson scored the fourth goal. NHL All Access has a good piece on Marty Erat. Rumors over the weekend have trade talks about Dan Hamhus on several fronts. The Ottawa Citizens has him on a list with several others that the Senators may be interested. James Murphy reports that Boston has an interest. From @kausatoday Young Josh Sacco who received 2 million hits on YouTube for his Herb Brooks impersonation performed for the U.S. hockey team dinner Saturday. Here is a note from the LA Times. Brandon Worley also comments. In one of the stranger stories I have seen lately comes this one about Bobby Ryan living under an assumed name and on the run as a young hockey player. I had to do a double check to make sure it wasn't an Intent to Blow story. This is similar to the storyline in the movie Mickey. Chris and Adrian have the guys from Kingscast as Episode 42 of Hockey Zen TV as part of their Fan Series. It does include a Preds mention. Stay tuned for a future episode involving a couple of Preds fans that you all know. Matt Reitz has the final word on why NBC is wrong in not believing that Hockey is better than figure skating. He also has his weekly Hockey Fan in California post. The player tracker (by team) at NHL All Access is a handy tool. Jonas Hiller's blog at Ducks.com is interesting. Chris Johnson talks about the NHL player's adjustment to International rules. The importance of the larger crease in goalie excellence at the Olympics is explored at NHL Digest. Steve Wilson of Blackstone Sports, inventor or the Flat Bottom V skate sharpening method has set up shop at the rink in Vancouver. He is Tweeting and blogging sporadically from the Olympics. AHL Commissioner David Andrews was a guest on XM204's HTM and discussed Sunday's outdoor AHL game and other AHL news. The game was a huge success, drawing 21,000. Flames Nation discusses discord in the Calgary dressing room. This is for my wifey, the Kindle addict. They now have a Kindle app for the Blackberry. The other day we discussed Please Rob Me. Now here is a post showing the dangers of Google Buzz. This makes it far more easier for a crook or con artist to commit robbery of your house. From @belcourt: The Belcourt in 1963. Not only is the article interesting, the entire publication is a throwback to simpler times. Finally, my friend Nick Giglia was concerned about my newbie mistakes on Foursquare and showed me the Please Rob Me site. Luckily, out here in the sticks, most of the criminals are transient crack heads that are too busy chasing their next rock to get on the internet. If a more sophisticated type reads this, be aware that we do have monitored alarms and don't mind shooting intruders. This is Tennessee and we do have a reputation to uphold. The Nashville Predator's Patric Hornqvist has traveled a interesting journey from being the last player chosen in the 2005 NHL Entry Draft to playing on one of the top lines of Sweden, the defending Olympic champion at the 2010 Olympics in Vancouver. The 23 year old native of Sollentuna, Sweden, grew up playing hockey in his native land. He played on a couple of different junior teams as well as for Djurgarden in the competitive Swedish Elite league. As a twenty year old, Hornqvist was named the Rookie of the Year in Sweden in 2006-2007 scoring a team high 23 goals, which broke the rookie record set by his boyhood idol, Peter Forsberg. That season, he also had his first adult international experience playing in both the World Juniors and the World Championships. The following season he played in Sweden again and returned to the World Championships in Quebec City, Halifax. It was there, in Canada, that he really caught the attention of the Predators as he led Sweden in goals with six, which was the second highest number in an event that is second only to the Olympics in prestige of international competitions. Hornqvist came to North America for the first time last season when he played 28 games for the Predators and 49 games for the Pred's AHL affiliate in Milwaukee. He started the 2008-2009 season with the Predators but was over-matched and spent the season shuttling between Nashville and Milwaukee. With the Preds, he had two goals and five assists. While in Milwaukee he had more success, scoring 17 goals and picking up 18 assists. At the end of last season, Hornqvist sat down with the Predator's brass and was given specific things that he was expected to accomplish in the off season. During the summer, he worked with a coach in Europe and made vast strides in his skating ability . The biggest difference this season has been his mental adjustment to the NHL level of play. His confidence has grown, game by game as the game has "slowed down for him" as Coach Barry Trotz describes his transformation into a top-six forward for the Predators. His statistics are indicative of his improved play as he leads the Predators with 23 goals and also has 14 assists. Hornqvist has earned most of his points by going to the "dirty" areas, battling in front of the net and in the corners. Barry Trotz has repeatedly compared him to fellow Swede, Tomas Holmstrom, who is one of the best at setting up in front of the net, distracting the goaltender and putting loose rebounds into the net. While Hornqvist is the second youngest player on Team Sweden, based on his excellent play this year in the NHL, he was placed on one of the the top two lines with Peter Forsberg and Henrik Zetterberg, who are both future NHL Hall of Famers. Sweden is the defending gold medal team from 2006 and is one of six teams in Vancouver that is expected to compete for medals. Matt Reitz has a much better story on Patric Hornqvist than the one above that I wrote for the Daily Herald. View from My Seats is one of the best hockey sites on the web. It should be a daily read for all. Jim Diamond writes about Ryan Suter and Shea Weber logging big minutes for their Olympic teams. From Dirk the @Forechecker: "OnTheForecheck.com passed the 500,000 page-view mark earlier this morning, as the 1st anniversary approaches". Congrats to Dirk for a great year and the best Pred's coverage available anywhere. Dirk also has the final piece of the SWOT series on Threats and will have his compilation soon. The parody David Polie account was resurrected... RT @DavidPoile: @dellis39 Don't worry, I've got big plans for this team. We just have to make sure Radulov doesn't catch his plane out of Vancouver. Ryan Suter makes USA Today. He also has a video interview at NHL All Access. The Hockey News has a nice Shea Weber piece too. Here's a request from a Preds prospect for help in is class. Add Him! RT @BlakeGeoffrion: So if i have the most "followers" on my twitter account i recieve 1 extra credit point in my class so lets spread the word ladies and gents. Rachel has another entry into the Olympic commercial smackdown, this one from Canada with kids acting like kids. The first two upsets of the Olympic hockey tournament came on Thursday as Canada only got two of three points as they was taken to the shootout and eventually beat Switzerland 3-2. In the late game, Slovakia beat Russia 2-1 in the shoot-out. Team USA played the role that they were expected to play as they beat Norway 6-1. Today's schedule includes Belarus and Sweden at 2:00 p.m. CST (USA), Czech Republic and Latvia at 6:30 p.m CST (CNBC), and Finland and Germany at 10:55 p.m. CST (CNBC). The Hockey Zen Episode 41 asks the question Gary Bettman wouldn't answer, "Should NHL players play in the Olympics?" Our Monday guest on POTG Radio, Steve Lapore, takes NBC to task over their poor hockey coverage. Also from our other Monday guest from Intent to Blow, comes a post on the NHL making rules to slow down Ovechkin. Tom Reed at Puck-Rakers takes a shot at the peacock. The Wall Street Journal Online gets in on the NBC bashing. For those wanting to give NBC the Bird, go here to a graphic designed by Travis Hair that he says is free for all to use. As expected, no decision on the 2014 Olympics for NHL players will be forthcoming anytime soon. Michelle Kenneth has here third post in her Olympic series. This time it is on Ilya Kovalchuk. Here's the story on the fake jeans that the USA snowboarders are wearing. Finally, Puck Central has the video of Chris Chelios' DUI arrest. He didn't look too steady. I sent the following brief email to them complaining about the poor coverage afforded to hockey at the Olympics. Initially I was unhappy with hockey being removed to your cable stations (USA, CNBC, MSNBC) because I do not get them in HD. I overcame my disappointment with the thoughts that at least the games would be center stage on the cable channels and be shown in their entirety. Now that I see they are pre-empted by curing, commercials, and women's hockey, I am even further disappointed in your coverage. I will say that overall, the coverage is better in the other sports than in Torino but as an partner with the NHL in their Game of the Week coverage, it would behoove your interests to give Olympic hockey more of a priority. In return, I received an email and was asked to join an "panel" to give my opinions. We are putting together a select group of dedicated viewers and consumers to provide their opinions about media, advertising, shopping, and much more! We need all types of viewers and consumers; so don't worry what networks or programs you usually watch or websites you visit. Rest assured that your time and privacy are of the utmost importance to us and we will always respect both. We appreciate your time and your input is invaluable. Thank you in advance for becoming an advisor. We look forward to getting to know you better and hearing from you. Click here to join the Contemporary Consumers Advisory Panel, and have your voice heard! Let's get started with a few questions, this will help us identify the sorts of things you may be most interested in talking about. I assume if you are interested, you can go here and join the panel too. Give it a try if you are interested. As the dasy go by in Vancouver, NBC finds new ways to irritate the hockey faithful. Initially, the major complaint was that hockey was moved off the primary NBC local channels to MSNBC, USA and CNBC. The expected silver lining was that the games would have priority there and be shown in their entirety. That hasn't happened as several games have been "joined in progress", the worst of which was last night's prime time Sweden - Germany match which wasn't joined until the second period due to a curling over run. Tuesday's Canada-Norway game started on MSNBC and then moved to CNBC. Another major complaint has been the games have not had the customary three TV commercial time outs per period that NHL games have. That has not deterred NBC from running 30 second spots in place of live action. One of my primary complaints, that is more IOC related, is that the audio rights are so tightly held that there is no radio broadcast of the games on XM or anywhere else that is readily available. Also, it is idiotic that XM can't run highlights from the game and have resorted to using clips of regular NHL games as fill when giving the game story. We will hear more about NBC and their poor coverage and more when we have Steve Lepore of Puck The Media as a guest on POTG Radio on Monday. Steve has announced that a new rant against NBC will be up at his site this morning. We will also have a guest from the fun newer web site, Intent To Blow. Our local five year old hero, Josh Sacco is the Predators correspondent in Vancouver. He was sent there courtesy of The Ellen Show and got to meet his hero Mike Eruzione. When we had Natalie Darwitz on POTG Radio a few weeks back we found that the women's team wanted to meet Josh and get the "speech" from him. We made an effort to make it happen but have yet to see any fruit. The women's team will be on The Ellen Show so maybe it will happen then. There is more from the Tennessean on the the Sports Council's stated demands to the Predators regarding having David Freeman's IRS tax lien resolved by March 5th. Here is a copy of the actual letter. From what I understand, Freeman has paid what he feels that he owes and is waiting for a response from the IRS. I'm not sure what he can do to make them move faster, but we will see. Mark Willoughby has more pictures from his recent road trip at The View from 111. Amazingly WZTV gave more air time to Tuesday's public skate at the Sommet Center than they usually give the actual games. AJ has more in his series of Calling it as I See It with an update on Jordin Tootoo. Dirk The Forechecker has a handy chart of Olympic stats for the six Preds. What about Radulov? In His SWOT series, Dirk is asking for opinions on opportunities. Next Tuesday, Zanies is hosting a night of hockey comedy with three great comedians, Terry Crisp, Stu Grimson, and Jim McKenzie. Sounds like a great evening. The Coke commercial is on the table at What the Puck's commercial smackdown. Dirk at OnTheForecheck has the highlights of yesterday's Olympic action including Sweden's 2-0 win over Germany, Finland besting Belarus 5-1, and the Czech Republic beating Slovakia 3-1. Today's games will feature the USA playing Norway at 2 p.m. CST (USA Network), Switzerland playing Canada 6:30 p.m. CST (CNBC) and Russia playing Slovakia 10:55 p.m. CST (CNBC). Michelle Kenneth continues her Olympic coverage with a story on Patrik Elias. The Nashville Predators have supplied the German National Team is playing in the 2010 Winter Olympics with two of its more experienced players. Veteran Marcel Goc, as well as rookie Alexander Sulzer are two of the seven NHL players to play for Germany in this year's Winter Games. Marcel Goc was signed by the Predators last Summer after playing four seasons with the San Jose Sharks. The 26 year old center was born in Calw, Germany and is the highest German draft pick in history being drafted 20th overall in the 2001 NHL Entry Draft by San Jose. The Predators have been surprised with Goc's offensive contributions this season. He was signed originally as a roll player for his face-off abilities and defensive capabilities for Nashville's energy or grinder lines. In 52 games prior to the Olympic break, Goc has 11 goals and 10 assists while centering the Preds third line and taking most of the face-offs in the Predator defensive zone. Goc has represented Germany on the international level almost every season since he was a teenager. He has played on ten different teams including four World Junior squads, four World Championship teams, and one World Cup of Hockey. In 2006 he played on the German National Team at the Olympics in Torino. He played in all five of Germany's games and scored one goal. Alexander Sulzer has split time with the Predators and their AHL affiliate in Milwaukee this season. He was penciled in as the Pred's sixth defenseman in the preseason but has been edged out for much of his expected playing time by the surprising emergence of rookie Cody Franson. In Nashville, Sulzer has played in 19 games and has two assists. At Milwaukee, he has been much more productive, producing at a point per game pace with four goals and 15 assists in 19 games. Sulzer was drafted in the third round of the 2003 NHL Entry Draft that was held in Nashville. He was in the same Predator draft class as Kevin Klein and Olympians Shea Weber (Canada) and Ryan Suter (USA). The twenty-five year old Sulzer was born in Kaufbeuren, Germany and has played on five previous German National teams. He has played in the World Championships three times and the World Junior team once. Sulzer was a team mate of Goc's at the 2006 Olympic games. He also played in five games and had one assist. Germany is a decided underdog in this year's Olympic Hockey Tournament in Vancouver. They are seeded last in the 12 team field and will struggle to win a game as they are in a round-robin group with Sweden, Finland and Belarus. Regardless of how the German team fares, the Olympic experience will be the same for Marcel Goc and Alexander Sulzer as is is for any of the other thousands of athletes that come from around the world to compete against the best in the world in their individual sports. Germany opens their play tonight in the primetime game at 6:30 CST on CNBC against Sweden. The other two men's games today are Finland versus Belarus (2 p.m. CST, MSNBC) and Czech Republic and Slovakia (10:55 p.m. CNBC). Mark Willoughby continues to share adventures from his trip with Random Ruminations from the Road. Paul McCann previews tonight's Hockey Buzz Radio and has a few thoughts about the Versus-DirecTV debacle. Jim Diamond has the story on the two Predator prospects who won weekly awards. Rachel at What The Puck is looking for comments on Olympic commercials. Here is the first up for your perusal. Center Ice Magazine has an article on Blake Geoffrion. Terry Crisp talks to NHL.com about the Olympics. They also have a Marty Erat story. If you missed the premiere episode of Red Light District Radio, here is the link to the podcast. Forechecker continues the SWOT series asking for input on weaknesses. Dirk also has the full text of the press releases from the Predators on prospects Blake Geoffrion and Michael Latta's player of the week honors in separate leagues. Forechecker also has a look at at yesterday's US and Canada games and news of the Swedish lines. Yesterday's games produced no surprises other than the small margin in the US beating Switzerland 3-1. Canada easily handled Norway in an 8-0 win and Russia showed a few defensive cracks in an 8-2 win over Latvia. Predators Ryan Suter and Shea Weber each picked up an assist in their respective games. Ryan Suter took a bad roughing penalty in the third period that led to Switzerland's power play goal. Excommunicated Predator Alex (Rudy) Radulov scored Russia's second goal and resulted in an outpouring of hate from Predator fans on Twitter. Michelle Kenneth interviewed Team USA Captain Jamie Langenbrunner and has a good article from it. Here's another take on Langenbrunner's intentions at the Olympics from Intent To Blow. Puck Daddy Takes a look at the struggling goaltenders heading into the Olympic tournament. Bill Daly was on XM204's HTM on Tuesday talking about the NHL's participation in the Olympics. Versus has a story about the five patsies at the Olympics. Could any of these non NHL filed teams provide an upset? Puck Report continues their quality Olympic coverage with a look at what Team Canada's second and third team would look like. Dan Hamhuis and the other Preds from Canada must be on the fourth team. From the Rink has Part 1 of a look at the 51 returning Olympians. For those in the New York/New Jersey area, mark your calenders for the WhatsBrewinStock event set for March 20th. We will be involved in some way from afar even if it is only for the radio telethon part of the festivities that will follow on March 25. Another episode in the referee apocalypse from Chris Wassel. Mirtle has a look at league wide and individual team attendance figures for the season so far.